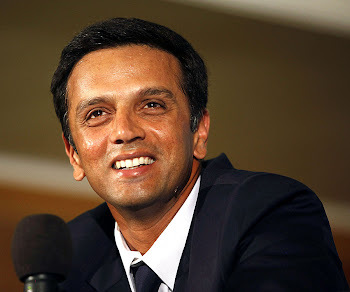 Rahul Dravid --> 52 from 35 which included 5 lovely fours and 2 hammerings over the rope. Surprised? I was - not because he hit 2 sixes but because finally RCB team management gave him a chance to bat. Chasing 160, RCB lost Kallis early and Dravid was sent up the order. And with Sriram struggling to score at the other end, it was the change in the duty for The Wall to turn into a canon. He started with a fierce pull shot and it was Gayle who did a mistake of trying stopping it (he had to move to the dug-out for some treatment). This shot was followed by some of his (or ours?) favourites- late-cut, square cut and a straight drive. He went on to score 2 consecutive sixers to score his 1st half century in IPL-3. After Dravid, Uthappa butchered the KKR bowling attack and produced an amazing 22 ball 52. Before that, it was a brilliant effort from RCB bowlers to restrict KKR to a gettable total of 160 on a bouncy track. At the stage when KKR were 83/1 in 10 overs, it was quite clear that they may put a massive total on scoreboard. But it was Anil Kumble who made the batsmen sweat for the runs with clever bowling (17 runs from 4 overs). Steyn also used his pace to make the KKR batsmen struggle. It was overall a good effort from team RCB. They have to win 2 out of the next 3 games.Go RCB, go! hERe ComeS My HERo ....LIvIn CrIckeT legEnd...!! !